Transition eyeglass lenses are a widely sold option in eyewear. Transition lenses make it possible for the wearer to go from a dark room to full sun without having to switch glasses, as the lenses darken when exposed to sunlight. The darkening component is built into the lens so, like other eyeglass lenses, they are made in both plastic and glass and can have scratch-resistant coatings applied. If you aren't careful, however, the transition lenses can scratch. Small scratches can be removed using the same techniques used on regular plastic and glass lenses. 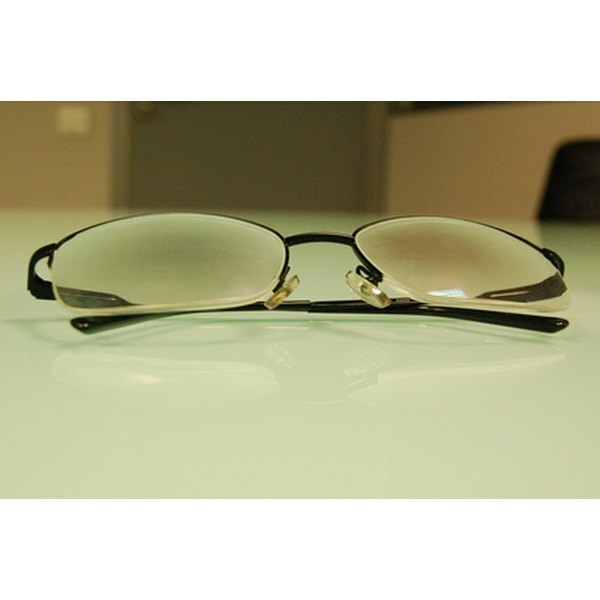 Apply a thin coating of Armor Etch glass etching compound to the plastic lenses of your glasses. Let the solution sit for several minutes and then remove it with water and the mildly abrasive cloth. The Armor Etch will remove the scratch-resistant coating on your Transition lenses and any superficial scratches that are on that surface. Repeat several times if necessary. Do not use this product on glass lenses. Spread an eyeglass scratch filler or white grease pencil directly over the scratch in your Transition lenses. Let the product sit on the scratch for several minutes and then buff it with a dry, mildly abrasive cloth. Make a paste with an abrasive cleaner such as baking soda or powdered cleanser. Wipe it on the surface of your Transition lenses. Work it into the scratches with the mildly abrasive cloth in a circular motion. Rinse. Apply a small dab of a paste-type toothpaste to your Transition eyeglass lenses. Work the toothpaste into the scratch. Allow it to dry and sit for several minutes. Rinse with water. It is not necessary to complete all the above steps. If one technique adequately removes the scratches in your Transition eyeglass lenses, skip the remaining steps. However, if Step 1 does not work as well as expected, go on to subsequent steps until you find the technique that is most effective. If Armor Etch is used, your eye doctor may be willing to reapply the scratch-resistant coating for a small fee. It is easier to repair small and superficial scratches using these DIY methods. Large scratches may not completely disappear. Test all scratch-repair techniques on another similar item before attempting to repair your Transition eyeglass lenses. Products that work for plastic lenses may harm glass. The Optical Blog: Can I Remove Scratches From My Eyeglasses?